Waterloo, SA: Kym Dixon with another victim of wind cult doublethink. The information in this article is truly alarming! Did you realize that birds are being electrocuted on transmission wires? politicians acting out of vested interests, pushing the not -fit- for -purpose wind industry. It is a World wide scam. Thank you STT for continuing to expose the corrupt activities and cover up. 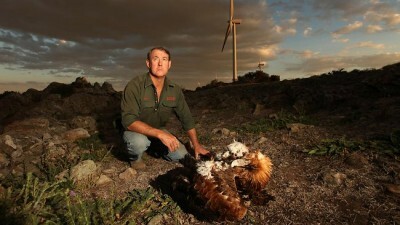 Apart from the deliberate slaughter of birds and bats the wind industry knowingly destroy human’s quality of life. We all have a legal right to live in peace and quite in our own homes. Speaking of (metal) birds. Boeing and Wind Turbines. They’ve got history. It’s was a pretty ugly machine though. Thank goodness they continued with aircraft design and production. The Bonneville Power Administration bought output of the Goodnoe Hills machines and integrated it into the regional power grid through lines owned by Klickitat County Public Utility District. By May 1981, the three machines working together at the Goodnoe Hills site became the first “wind farm” in the world. 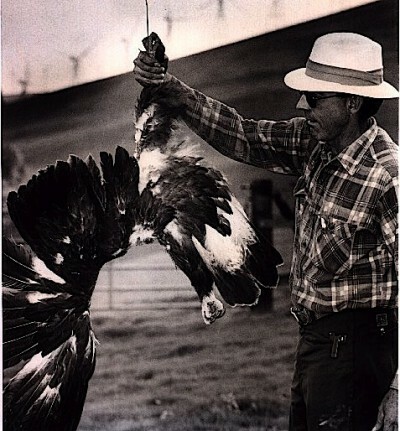 The MOD-2 wind turbines of Goodnoe Hills were running through 1986 and then dismantled. In 1985, the last full year of operation, the combined electrical output of the three turbines was 8,251 megawatt-hours — enough to power about 1,000 average Northwest homes for a year. Project manager Peter Goldman called the five-year, $55 million research project “an absolute success.” The Medicine Bow MOD-2 wind turbine was sold for scrap metal in 1987 and dynamited over. The next-generation Boeing-built wind turbine, the MOD-5B, was barged to Kahuku on the island of Oahu in Hawaii in 1986 and was running by July 1987. It weighed 939,000 pounds (425,923 kilograms )and had a 320-foot-diameter (97-meter-diameter) two-blade rotor on a 200-foot (61-meter) steel tower. It was entirely automatic, with software changes made using the public telephone system. It operated in winds from 9 to 60 miles (14 to 96 kilometers) per hour and could reach rated power at 7.2 megawatts at wind speeds of 30.6 miles (49 kilometers) per hour. At a rotational speed of 17.2 rpm, the blade tip velocity was 206 miles (331 kilometers) per hour. By Nov. 20, 1987, it completed its first 1,000 hours of operation and had produced enough electrical energy for 1,500 homes.